On the weekend leading up to 2016's first presidential debate, four news organizations came to a similar and sweeping conclusion: Donald Trump lies more often than Hillary Clinton. In a normal election year this would be extraordinary. On Sunday editors and reporters at the newsrooms used another word: necessary. The New York Times story — "A Week of Whoppers" — came out first on Saturday. Politico, The Washington Post and The Los Angeles Times all followed within hours. Several of the editors who were involved said the timing was a coincidence. But there was clearly a desire to publish stories before Monday's debate, when Trump and Clinton's truthfulness will surely be at issue. "Never in modern presidential politics has a major candidate made false statements as routinely as Trump has," the L.A. Times declared on page one of Sunday's paper. Politico Magazine's team analyzed every statement made by both Trump and Clinton for five days and said "the conclusion is inescapable: Trump's mishandling of facts and propensity for exaggeration so greatly exceed Clinton's as to make the comparison almost ludicrous." The words "almost ludicrous" ricocheted around Twitter. Politico found that Trump averaged "one falsehood every three minutes and 15 seconds over nearly five hours of remarks" while Clinton averaged one falsehood every twelve minutes. Overall, the news outlet counted 87 "misstatements, exaggerations, falsehoods" from Trump and eight from Clinton. The Times counted only Trump's "biggest whoppers," 31 of them, while skipping "dozens more." All four of the newsrooms distinguished between the kind of misstatements Clinton makes and the kind Trump makes. "Clinton has made her share of questionable claims," the Post said, but Trump "at times seems uniquely undeterred by facts." The Post said Trump "continues to rely heavily on thinly sourced or entirely unsubstantiated claims." The four stories were welcomed by the Clinton campaign; aides cited the statistics in television interviews on Sunday. However, there is no indication that the Clinton campaign was involved. Marty Baron, the executive editor of The Washington Post, said the timing of the stories was a coincidence. "We don't coordinate coverage with anyone else," Baron said. The Post did not label any of Trump's falsehoods as "lies" in its story. But the other three news outlets did. Media critics detected an uptick in journalists accusing Trump of lying when the "birther" issue was revived earlier this month. Even while finally declaring that he knows President Obama was born in the United States, Trump invoked additional lies, falsely claiming that Clinton introduced "birtherism" in 2008 and that he put the conspiracy theory to rest in 2011. The next day's New York Times headline explicitly used the "L word" journalists are usually reluctant to use. 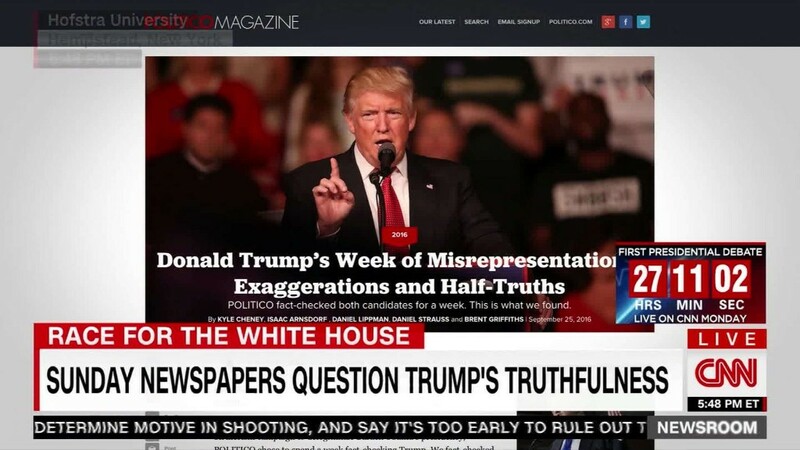 "I do think that our story on the day that Trump sought to reverse himself on birtherism -- which said outright that Trump was 'lying' -- sent ripples through the journalistic world," Times political editor Carolyn Ryan said Sunday. "Other news organizations are eager to capture what is clearly an unprecedented dynamic," she said. The Times' latest story, on page one Sunday, concluded that Trump's falsehoods fit a pattern: "Virtually all" of them "directly bolstered a powerful and self-aggrandizing narrative depicting him as a heroic savior for a nation menaced from every direction." Some Trump critics responded to the coverage by saying, in essence, "What took you so long?" MSNBC host Lawrence O'Donnell tweeted the L.A. Times front page and said "Congrats to LA Times for finally calling a lie a lie. (A year late)." Politico editor Susan Glasser noted that her publication examined a week's worth of Trump falsehoods during the primary season, with unflattering results for Trump. Politico "thought it was the right time to do it again, given all the attention to the question of Trump's relation to the facts," she said, noting that Clinton's words were also scrutinized this time. Glasser suggested that Trump's flouting of the truth has worsened since the primary season: The falsehoods went from "one every five minutes in that earlier piece to one every three in this one."